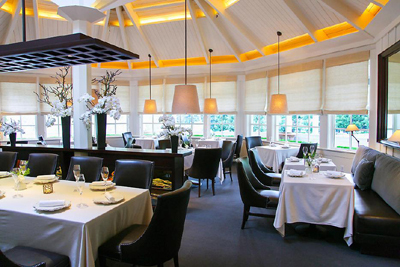 The Restaurant at LANGDON HALL R&C sp (Executive Chef: Jonathan Gushue). 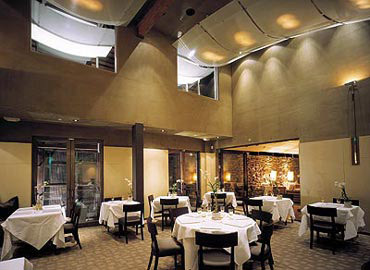 THE DINING ROOM AT POST HOTEL & SPA R&C WS (Executive chef: Hans Sauter). TOQUÉ R&C. Grand Chef: Normand Laprise. Restaurant Initiale R&C. Grand Chef: Yvan Lebrun. L'Eau À la Bouche R&C. Grands Chefs: Anne and Emmanuel Desjardins. 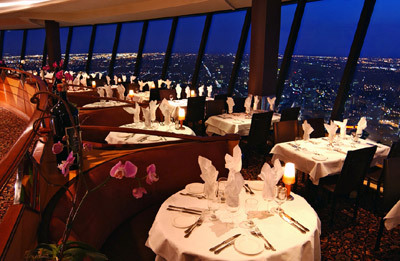 360 The Restaurant at the CN Tower - world's second highest and largest revolving restaurant: 351 metres (1,151 ft). Executive chef: Peter George. Bacchus Restaurant & Lounge R&C. Executive chef: Lee Parsons. At Wedgewood Hotel & Spa. BLUE WATER CAFE (Executive chef: Frank Pabst). MARKET BY JEAN-GEORGES SDA. At the Shangri-La hotel. 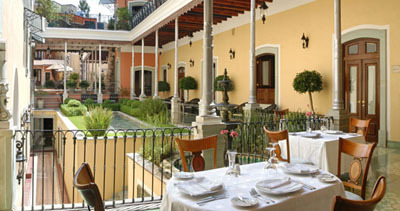 Mexico's five best restaurants - The Telegraph. Laja SP (Chef: Jair Téllez). Cuisine: Baja Californian. BIKO SP (Chefs: Mikel Alonso, Gerard Bellver & co-owner Bruno Oteiza). Cuisine: Spanish and Mexican modern fusion. Mero Toro SP (Chef: Jair Tellez). Cuisine: surf and turf. 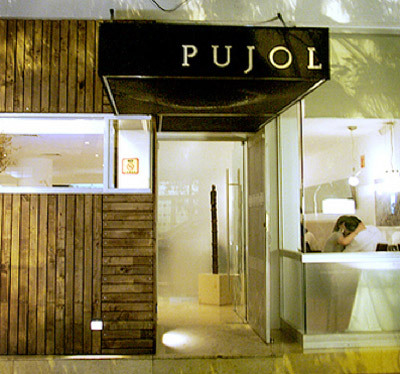 PUJOL SP (Chef: Enrique Olvera). Cuisine: Mexican reinvention. Quintonil SP (Chef: Jorge Vallejo). Cuisine: modern Mexican. Sud 777 SP (Chef: Edgar Nuñez). Cuisine: international. Taqueria EL PASTORCITO - voted Mexcixo's best tacos restaurant. Order: tacos al pastor. Casa Oaxaca SP (Chef: Alejandro Ruiz). Cuisine: modern Mexican. Pitiona SP (Chef: José Manuel Baños Rodriguez). Cuisine: modern Mexican. Taco Trucks NW. Specialty: carnitas, al carbón tacos. Corazon De Tierra SP (Chef: Diego Hernandez). Cuisine: Baja Californian. BOURBON STEAK - at Fairmont Scottsdale Princess Hotel. 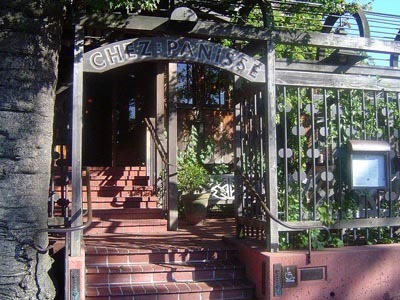 CHEZ PANISSE sp. Founded 1971 by Alice Waters - 'the mother of American cooking'. Armstrong - Schroeder's - 7956 Wilshire Blvd. "Beverly Hill's Oldest Restaurant." Closed in the mid-1960s. Was frequented by the Hollywood in-crowd for breakfast. MATSUHISA - 129 N La Cienega Blvd. Chef: Nobuyuki Matsuhisa. Sushi bar. ROMANOFF'S - (1941-1962). 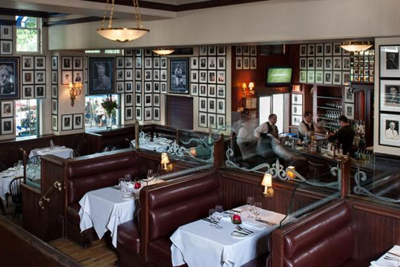 Beverly Hills (Rodeo Drive) restaurant popular with Hollywood stars in the 1940s and 1950s. SPAGO BEVERLY HILLS ** WS. "Wolfgang Puck Seasonal American Restaurant." Executive Chef: Lee Hefter. 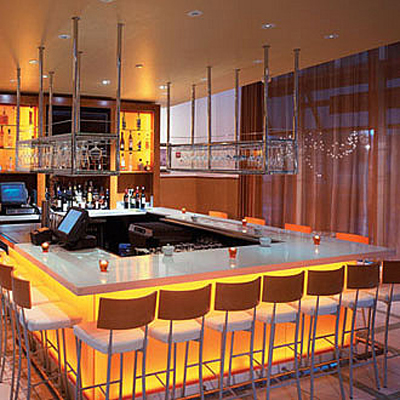 The flagship restaurant of the Wolfgang Puck Fine Dining Group. The Bistro - catered for decades to high-powered crowd thick with denizens of the film industry and high society. The Bistro was a favorite of Billy Wilder and Elizabeth Taylor. 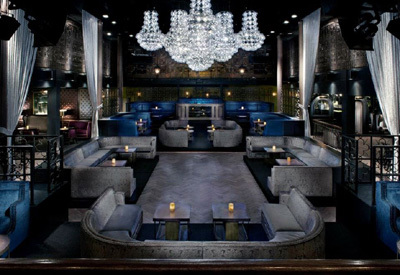 THE IVY - one of L.A.'s leading celebrity hangouts, attracting a virtual Who's Who of Hollywood stars and moguls. The Palm - since 1926. 267 N. Canon Drive. "Located along Canon Drive's Restaurant Row. This location has quickly become a favorite of the movers, shakers and celebrities of Beverly Hills. Local attractions including Rodeo Drive, the famous Beverly Hills sign, the Wallis Annenberg Center for the Performing Arts, the Beverly Hills Music Hall and the Academy of Motion Picture Arts and Sciences." The Polo Lounge - at the Beverly Hills Hotel. 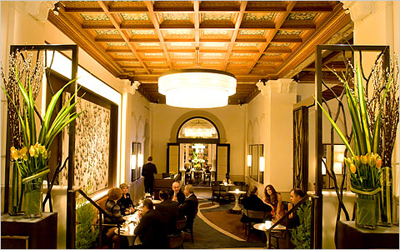 The Polo Lounge is seen as the premier power dining spot in all of Los Angeles. There are three dining areas complete with the signature pink and green motif. The photograph behind the bar depicts Will Rogers and Darryl F. Zanuck, two lounge regulars, playing polo. The menu "still offers a classic Neil McCarthy salad, named after the polo-playing millionaire." TRADER VIC'S - since 1934. "Home of the Original Mai-Tai." URASAWA ** (Chef: Hiroyuki Urasawa). Japanese cuisine. 218 N Rodeo Dr. WOO LAE OAK - "Nouveau Korean." SAKAE Bib. Sushi & Grill. SOLBAR * (Executive chef: Brandon Sharp). Marinus WS (Chef: Cal Stamenov). LAURUS Bib. Southern European Bistro. RESTAURANT 301 WS. At The Carter House. 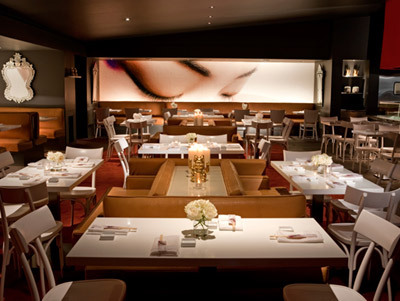 KATSUYA - stunning environment created by über-designer Philippe Starck, a beautiful clientele and inventive modern Japanese cuisine. APPLEWOOD INN & RESTAURANT * (Chefs: Tyja Taube & Michelle "Shelley" Cerneant). CYRUS ** (Chef: Douglas Keane). MADRONA MANOR * (Executive chef: Jesse Mallgren). BESO - owned by actress Eva Longoria Parker. Brown Derby - opened on Valentine's Day 1929 at 1628 North Vine Street in Hollywood, was the branch that played the greater part in Hollywood history. Due to its proximity to movie studios, it became the place to do deals and be seen. Cark Gable is said to have proposed to Carole Lombard there. Rival gossip columnists Louella Parsons and Hedda Hopper are recorded as regular patrons. After the Hollywood Brown Derby was largely destroyed by fire in 1987, the restaurant was closed. Kabuki - 1545 N. Vine St. Japanese cuisine. 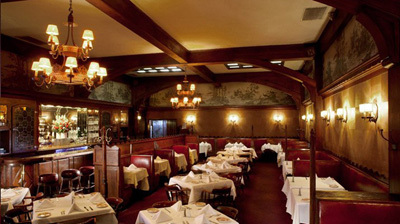 MUSSO & FRANK GRILL opened in 1919. The oldest continuing operating restaurant in Hollywood. Originally frequented by the likes of Gloria Swanson, Douglas Fairbank, Mary Pickford, John Barrymore, and Cecil B. DeMille. In the 1930s it was a favorite place for writers and playwrights such as F. Scott Fitzgerald, Lillian Hellman, Dashiell Hammett, Aldous Husley, Dorothy Parker, Dalton Trumbo, and Ernest Hemingway. SCHWAB'S RESTAURANT - "Hollywood's Living Room." Originally one of the classic old Hollywood diners. Trois Mec - since 2013. 716 N Highland Ave.
CHEVALIER RESTAURANT Bib. Chef: France Philippe Chevalier. ORTOLAN * (Chef: Christophe Émé). PATINA R&C WS (Master chef: Joachim Splichal). Located in the Walt Disney Concert Hall in Downtown Los Angeles. RACHEL - Ethiopian vegan cuisine. DIO DEKA * (Executive chef: Marty Cattaneo). Hellenic cuisine. 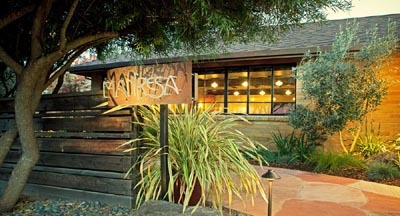 MANRESA ** SP (Chef: David Kinch). Cafe Habana - 3939 Cross Creek Rd. Cuban-themed Mexican Restaurant. 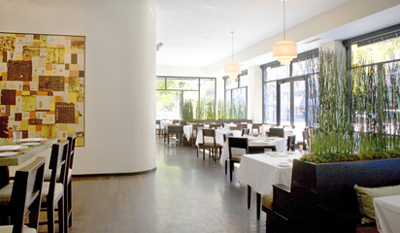 MADERA * (Executive chef: Peter Rudolph). 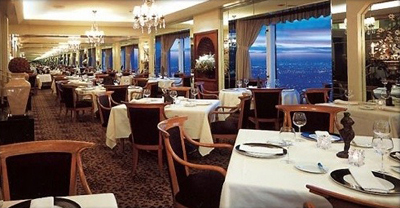 LA COSTANERA * (Chef: Carlos Altamirano). Comtemporary Peruvian cuisine. CHEZ T J * (Executive chef: Joey Elenterio). LA TOQUE * (Chef: Ken Frank). At The Westin Verasa Napa Hotel. UBUNTU * (Executive chef: Aaron London). Vegetarian cuisine. BAY WOLF Bib. Owned by Wolfgang Puck. EVVIA (Chef: Jim Wimborough). "Hellenic Cuisine in the Silicon Valley." BAUMÉ ** (Chef: Bruno Chemel). 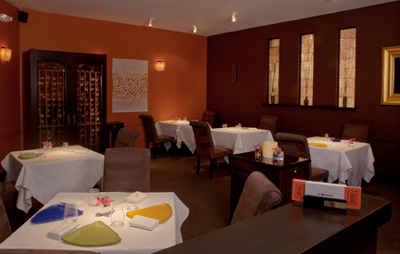 Il Fornaio - Italian cuisine. CROUCHING TIGER RESTAURANT Bib. Authentic Sichuan, Hunan & Mandarin Cuisine. AUBERGE DU SOLEIL * R&C (Executive chef: Robert Curry). TERRA * (Chef: Hiro Sone). THE RESTAURANT AT MEADOWOOD *** R&C (Chef: Christopher Kostow). ADDISON R&C WS (Executive chef: William Bradley). ACQUERELLO * WS (Chef: Suzette Gresham-Tognetti). Italian cuisine. ALEXANDER'S STEAKHOUSE * (Chef: Jeffrey Stout). AME * (Executive chef: Randy Lutz). APPLEWOOD INN & RESTAURANT * (Chefs: Tyja Taube & Michelle "Shelley" Cerneant). At Guerneville. ATELIER CRENN * (Chef de cuisine: Michael Evans). AUBERGE DU SOLEIL * R&C (Executive chef: Robert Curry). At Rutherford. AZIZA * (Executive chef: Mourad Lahlou). BAUMÉ ** (Chef: Bruno Chemel). At Palo Alto. BENU ** (Chef: Corey Lee). BOUCHON * (Executive chef: Michael Sandoval). At Yountville. BOULEVARD * (Chef: Nancy Oakes). CAMPTON PLACE * (Chef: Srijith Gopinathan). CHEZ T J * (Executive chef: Joey Elenterio). At Mountain View. COI ** sp NW (Chef: Daniel Patterson). Specialty: kelp & squid-ink pasta. CYRUS ** (Chef: Douglas Keane). At Healdsburg. DIO DEKA * (Executive chef: Marty Cattaneo). Hellenic cuisine. At Los Gatos. FARMHOUSE INN AND RESTAURANT *. At Forestville. FLEUR DE LYS * GTM (Chef: Hubert Keller). FRANCES * (Executive chef: Melissa Perello). GARY DANKO * R&C WS (Chef: Gary Danko). GREENS RESTAURANT - (Chef: Annie Somerville). Fort Mason, Building A. IN SITU - chef: Michelin-three-starred Corey Lee. Located at the SFMOMA, In Situ is an exhibition restaurant and collaborative project featuring chefs from around the globe. LA COSTANERA * (Chef: Carlos Altamirano). Comtemporary Peruvian cuisine. At Montara. LA FOLIE * (Chef: Roland Passot). LE CHARM Bib. French Bistro. LUCE * (Chef de cuisine: Daniel Corey). 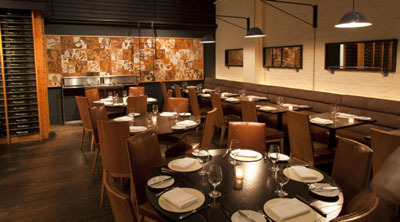 MADERA * (Executive chef: Peter Rudolph). At Menlo Park. MADRONA MANOR * (Executive chef: Jesse Mallgren). At Healdsburg. MANRESA ** SP (Chef: David Kinch). At Los Gatos. MASA'S * (Executive chef: Gregory Short). 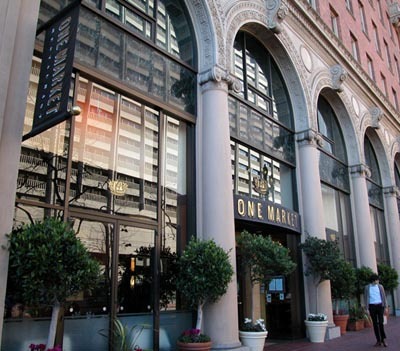 ONE MARKET * (Chefs: Bradley Ogden & Jody Ogden). PLUMED HORSE * (Executive chef: Peter Armellino). At Saratoga. QUINCE * (Executive chef: Michael Tusk). REDD * (Executive chef: Richard Reddington). At Yountville. RESTAURANT GARY DANKO * R&C WS (Chef: Gary Danko). RN74 WS (Chef: Jason Berthold). SAISON ** (Chef patron: Joshua Skenes). SANTÉ *. At The Fairmont hotel. At Sonoma. Sinbad's Pier 2 Restaurant - 141 The Embarcadero. CLOSED. SOLBAR * (Executive chef: Brandon Sharp). At Calistoga (Napa Valley). SPQR Bib NW. Specialty: ricotta gnudi. SPRUCE * (Chef de cuisine: John Madriaga). Swan Oyster Depot - 1517 Polk St.
TERRA * (Chef: Hiro Sone). At St. Helena. TERRAPÍN CREEK *. At Bodega Bay. 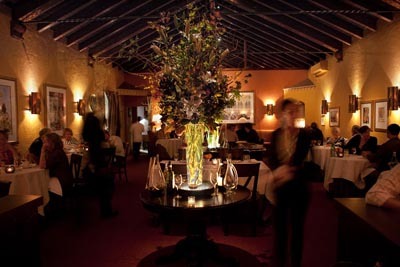 THE FRENCH LAUNDRY *** SP GTM R&C (Chef de cuisine: Timothy Hollingsworth). At Yountville (Napa Valley). THE RESTAURANT AT MEADOWOOD *** R&C (Chef: Christopher Kostow). At St. Helena (Napa Valley). THE VILLAGE PUB * (Executive chef: Dmitry Elperin). At Woodside. UBUNTU * (Executive chef: Aaron London). Vegetarian cuisine. At Napa. 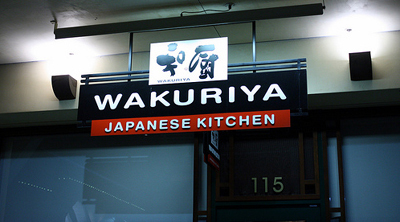 WAKURIYA * (Executive chef: Katsuhiro Yamasaki). Japanese cuisine. At San Mateo. YANK SING Bib. Traditional & Contemporary Deem Sun. WAKURIYA * (Executive chef: Katsuhiro Yamasaki). Japanese cuisine. FARMSHOP NW. Specialty: fresh burrata & fruit. Il Ristorante di Giorgio Baldi - 114 West Channel Road. "Expect "star sightings galore" at this "iconic" ultra-"expensive" Santa Monica Italian famed for its "out-of-this-world" handmade pastas; on the downside is a "dark", "crowded" dining room and sometimes "snobby" service ("if you are not a celeb, forget it")." THE PENTHOUSE - at the Huntley Hotel. VALENTINO WS (Executive chef: Nico Chessa). HACHI JU HACHI Bib. Japanese Cuisine. PLUMED HORSE * (Executive chef: Peter Armellino). SANTÉ *. At The Fairmont hotel. 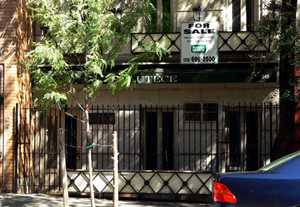 72 Market Street - closed in November 2000, about 14 months before the death of its founder, actor Dudley Moore. Gjelina - 1429 Abbot Kinney Blvd. Chef: Travis Lett. AGO - Italian cuisine. Chef: Agostino Sciandri. Includes among it owner-investors: actors Robert De Niro & Christopher Walken, producers Harvey & Bob Weinstein and director Ridley Scott. BLOWFISH - "Sushi to die for." CHASEN'S - (1936-1995). Was a hangout for entertainment luminaries. Located at 9039 Beverly Boulevard near Beverly Hills, it was the site of the Academy Awards party for many years and was also known for its chili. Many of its regular customers had booths named in their honor. Craig's - "An American Restaurant." 8826 Melrose Avenue. DAN TANA'S - old-fashioned, checkered-tablecloth Italian restaurant. Something of a local landmark, dating back to 1964. A favorite hangout for the Hollywood set. 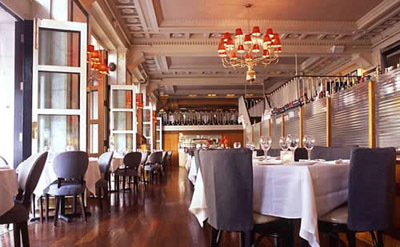 DOLCE - stylish Italian restaurant owned by a collection of celebrity investors. FORMOSA - "Where the stars dine." Le Dome - (1977-2007). 8720 W Sunset Blvd. Le Dome was co-founded by Elton John in 1977. The "chic French" restaurant was usually packed with Hollywood agents, producers and music-industry names like David Geffen, Danny Elfman and Berry Gordy. The restaurant was completely made over in 2003 but closed for good in 2007. Le Pain Quotidien - 8607 Melrose Avenue. Bakery & Communal Table. Lucques - 8474 Melrose Ave. Home of James Beard award winning chef Suzanne Goin and award winning sommelier Caroline Styne. Cuisine: mediterranean. "Since opening in 1998 Lucques has garnered extraordinary accolades and is now recognized as one of the country's best restaurants." Ma Maison - (1973-1985). 8368 Melrose Avenue. "The clubhouse to the stars." 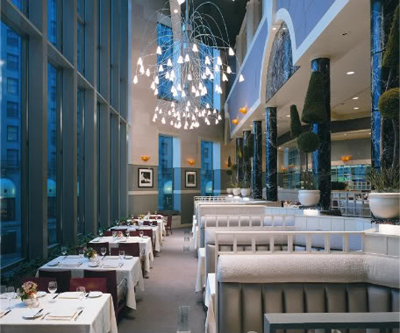 It is credited with getting Wolfgang Puck's career off the ground and being a hot spot for celebrities. Their phone number (655-1991) was unlisted, supposedly because "If you don't have the number, we don't want you." Rainbow Bar & Grill founded in early 1972 by Elmer Valentine, Lou Adler, Mario Maglieri and others, opening on April 16, 1972 with a party for Elton John. At the time, the word "rainbow" signified peace and freedom. It quickly became known as a hangout for celebrities of all types. John Belushi ate his last meal (lentil soup) at table #16. Before becoming the Rainbow, the restaurant was the Villa Nova restaurant, which was originally owned by film director Vincente Minnelli, at the time married to Judy Garland. Joe DiMaggio and Marilyn Monroe met at the restaurant on a blind date in 1952. THE VILLAGE PUB * (Executive chef: Dmitry Elperin). BOTTEGA Bib. Chef: Michael Chiarello. BOUCHON * (Executive chef: Michael Sandoval). REDD * (Executive chef: Richard Reddington). 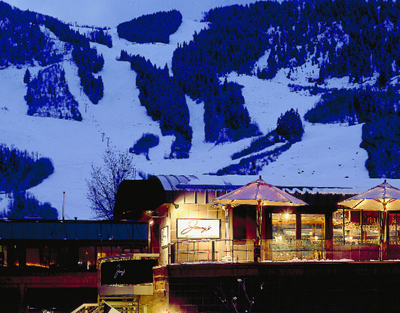 Aspen Restaurants - reviews. Sally's Place. 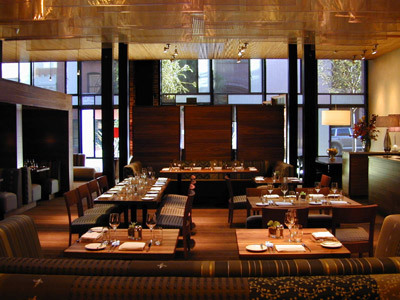 Aspen Restaurants - reviews. TripAdvisor. EATASPEN.COM - "Aspen's Dining Guide." AJAX TAVERN - "Best Outdoor Dining." At The Little Nell. Bentley’s at The Wheeler - perfect for people watching. Bonnie's Restaurant - 675 E Durant Ave. Boogie's Diner - 50’s retro restaurant. CASA TUA - 403 S Galena St. 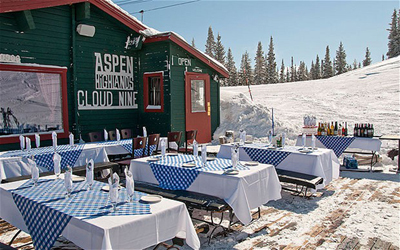 Cloud Nine Alpine Bistro - Cloud Nine Lift, Aspen Highlands (On-Mountain). KRABLOONIK - "World Class Dining & Unforgettable Adventure!" 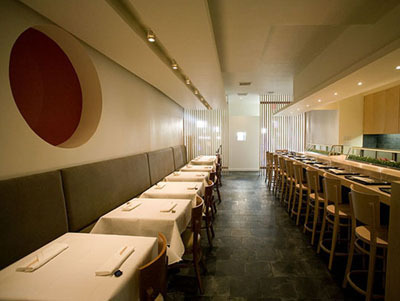 MATSUHISA ASPEN - "Gourmet Japanese seafood & sushi." Montagna WS (Executive chef: Robert McCormick). At The Little Nell. 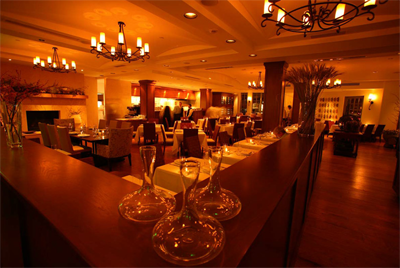 PACIFICA SEAFOOD & RAW BAR - "Aspen's Finest Seafood Restaurant." RUSTIQUE BISTRO - "One of America’s Best New Restaurants" (Esquire Magazine, 2001). Flagstaff House Restaurant WS (Executive chef: Mark Monette). HOMESTEAD INN R&C (Chef: Thomas Henkelmann). RESTAURANT THOMAS HENKELMANN GTM (Chef: Thomas Henkelmann). 6 Must Try Seafood Stops In Washington, DC - Scoutology. Adour at the St. Regis (Chef: Julien Jouhannaud). BEN'S CHILI BOWL - "The best chili dogs in the nations capital." CITYZEN (Chef: Eric Ziebold). At Madarin Oriental hotel. Harvey's Restaurant - (1858-1974). It entertained political and literary leaders for more than 65 years. Every President from Ulysses S. Grant to Franklin D. Roosevelt dined here. ICI URBAN BISTRO - at Sofitel Hotel. JUNIPER RESTAURANT - at The Fairmont. La Salle du Bois - (1941-1969). 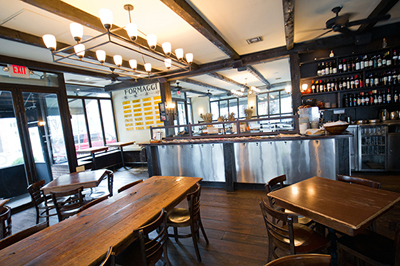 Was "popular with Georgetowners and others well-to-do [and] serves a mean crêpe Suzette." Jackie Kennedy's favorite restaurant. MICHEL RICHARD CITRONELLE GTM (Chef: Michel Richard). minibar by josÉ andrÉs - belongs to Eater.com's list of the 11 toughest restaurants to get a reservation in the world. 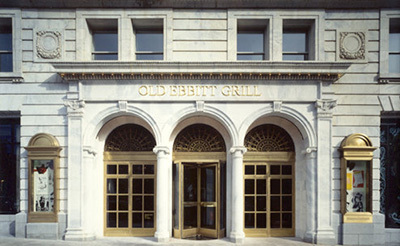 Occidental Grill & Seafood - 1475 Pennsylvania Ave NW. PALM RESTAURANT - since 1926. "Private Dining." 1225 19th Street, NW. 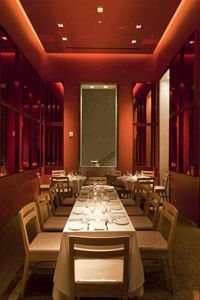 Rasika - "Modern Indian Cuisine." 633 D St NW. 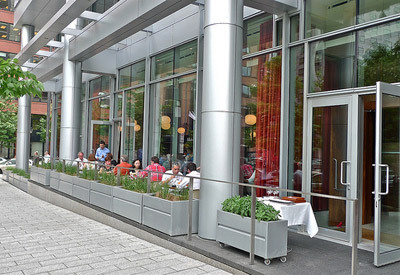 SIGNATURES RESTAURANT - 801 Pennsylvania Avenue NW. THE CAPITAL GRILLE - 601 Pennsylvania Ave. THE INN AT LITTLE WASHINGTON (Chef: Patrick O'Connell). The Jockey Club - (1961-2011). The first stop for every VIP in the nation's capital. Nancy Reagan was a regular; Frank Sinatra, Lauren Bacall, Kirk Douglas and Joe DiMaggio supped next to politicians and power brokers. Capra's Italian Ristorante - now closed. 8400 Biscayne Blvd. Frank Sinatra's favorite restaurant in Miami. DB BISTRO MODERNE - 255 Biscayne Blvd. Way. Chef: Daniel Boulud. JOEY'S - "A Modern Italian Café." SRA. MARTINEZ - chef: Michelle Bernstein. Located in a former Post Office built in the 1920's in the Design District. Zuma - 270 Biscayne Boulevard Way. 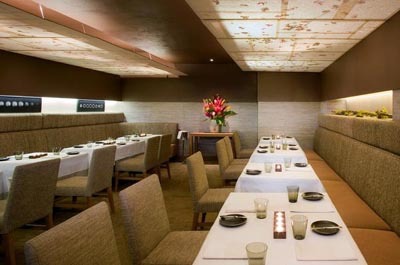 Cecconi's - 4385 Collins Ave.
Makoto - 9700 Collins Ave. Modern Japanese cuisine. Chef: Makoto Okuwa. MEAT MARKET MIAMI BEACH - executive chef: Sean Brasel. "A sexier, more glamorous take on the traditional steak house." Prime 112 - 112 Ocean Drive. 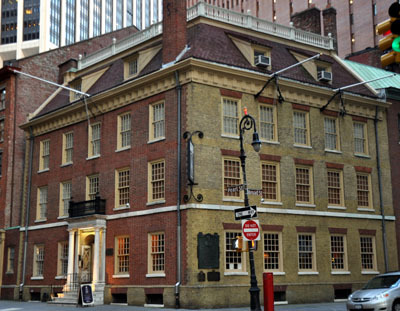 "The first modern steakhouse in the United States." PUBBELLY - Asian inspired Gastropub. 264 the Grill - 264 South County Road. Al Fresco - 2345 South Ocean Blvd. Amici Bar Ristorante - 375 South County Road. Atlantic Grill & Bar - at Four Seasons Resort, 2800 South Ocean Boulevard. Bice Ristorante - Executive Chef: Elmer Noel Saravia. 313½ Worth Avenue. Blue Provence - "L'Art de la Table." 300 South County Road. Breeze - at Eau Palm Beach Resort & Spa, 100 South Ocean Blvd. "Palm Beach’s best oceanfront burgers." Brick Top's - 375 South County Road. Buccan - 350 South County Road. CAFÉ BOULUD - at the heart of the historic Brazilian Court Hotel, 301 Australian Ave., steps from Worth Avenue and stretches of white sandy beach. Since opening in 2003, the restaurant has become one of Palm Beach’s most coveted dining destinations earning four stars in the Forbes Travel Guide and Wine Spectator’s “Best of Award of Excellence”. CAFE CELLINI - SDA. 2505 South Ocean Blvd. CAFÉ L'EUROPE - since 1980. SDA. Palm Beach's premier restaurant. The only champagne / caviar bar in Palm Beach. 331 South County Road. CafÉ Via Flora - 240 Worth Ave.
Charley's Crab - 456 South Ocean Blvd. 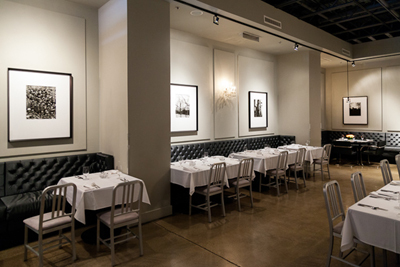 Chez Jean-Pierre Bistro - South Florida's highly-acclaimed authentic French Bistro. 132 North County Road. 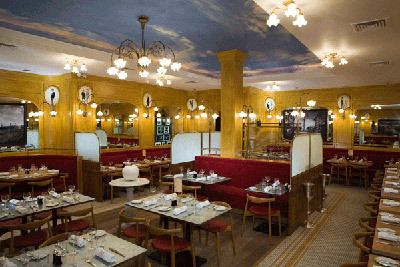 Club Colette - Café, Restaurant & Private Members Club. Opened in 1982 by Dan Ponton. Exclusive private dinner club. Onetime nonrefundable membership fee: US$7,500, plus US$1,500 annual dues. 215 Peruvian Avenue. Cucina Dell' Arte - 257 Royal Poinciana Way. 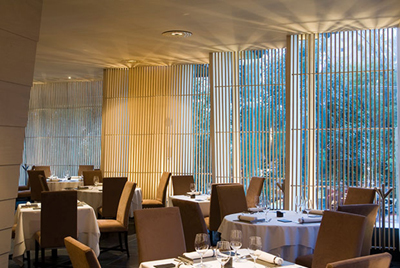 Echo Palm Beach - "Resounding Asian Cuisine." 230A Sunrise Ave.
Flagler Steakhouse - situated on the second floor of the Ocean Clubhouse of The Breakers. Graze - at Four Seasons Resort Palm Beach, 2800 South Ocean Blvd. Green's Pharmacy - 151 North County Rd. Imoto - 350 South County Rd. 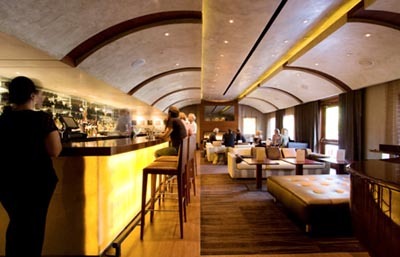 Jové Kitchen & Bar - at Four Seasons Resort, 2800 South Ocean Boulevard. Leopard Lounge Restaurant - at The Chesterfield hotel, 363 Cocoanut Row. Matteo Garden Club Restaurant - 140 Sunrise Ave.
Nick & Johnnie's - 207 Royal Poinciana Way. Located in the landmark spot Chuck & Harold's. Palm Beach Grill - "A Palm Beach Institution since 1999." 340 Royal Poinciana Way. PB Catch - "Seafood & Raw Bar." 251 Sunrise Ave.
Petite Marmite - 315 Worth Avenue. Landmark restaurant owned by legendary Gus Pacillo. (1949-1983). Pizza Al Fresco - 14 Via Mizner. 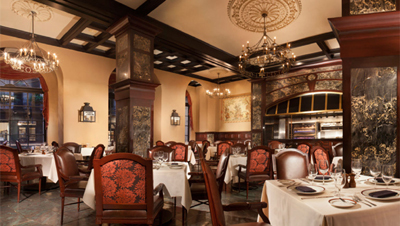 Renato's - "Palm Beach’s premiere destination for gourmet cuisine and impeccable service." 87 Via Mizner. Ta-boÓ - "Palm Beach's Legendary American Bistro & Bar." 221 Worth Avenue. Temple Orange - at Eau Palm Beach Resort & Spa, 100 South Ocean Blvd. Testa's - since 1921. Palm Beach's oldest restaurant. 221 Royal Poinciana Way. The Ambassador's Table - at The Ambassador Hotel, 2730 South Ocean Blvd. The Beach Club Restaurant - The Beach Club is available to Breakers hotel guests and club members only. The Circle - home of The Breakers celebrated Sunday Brunch. One South County Road. THE FLAGLER STEAKHOUSE - at The Breakers. One South County Road. The Italian Restaurant - at The Breakers. One South County Road. The Ocean Grill - with views of the pool and beach, as well as the panoramic 10th green of the Ocean Golf Course. The Omphoy - at Ocean Resort & Spa, 2842 South Ocean Blvd. The Seafood Bar - at The Breakers hotel, One South County Road. Tides Bar & Grille - 3550 South Ocean Blvd. TooJay’s Gourmet Deli Restaurant - 313 Royal Poinciana Way (Royal Poinciana Plaza). 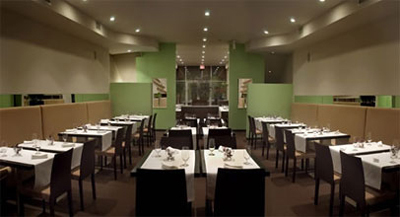 Trevini Ristorante - 290 Sunset Avenue. VIC & ANGELOS - "The best Italian in Florida." 4520 PGA Blvd., Palm Beach Gardens. LA SANDWICHERIE - since 1988. "La Sandwicherie captures the best of French savoir-faire in the simplest of settings to transport your taste buds to another world without costing you the earth." BERN'S STEAK HOUSE WS Since 1956. "Perfectly aged steaks. One of the largest wine collections in the world. An internationally famous dessert room. Wine cellar and kitchen tours available for all guests." Bern's founder, Bern Laxer, traveled the globe extensively exploring, researching and tasting wines that he could bring back and introduce to his guests back home. In time, the cellar grew to be one of the most respected and largest collections in the world. Today, our cellar contains more than 6,800 different selections with more than half a million bottles. Amici Brick Oven Pizzeria - 801 Village Blvd. Cafe Sapori - 205 Southern Blvd. E.R. Bradley's Saloon - 104 Clematis St.
La Sirena - 6316 S Dixie Hwy. Morton's The Steakhouse - 777 South Flagler Dr, Ste 100E. Ruth's Chris Steak House - "The Steak That Speaks For Iself." 651 Okeechobee Blvd, Ste 100. HAWAII DINER.COM - Hawaii restaurants. MERRIMAN'S - chef: Peter Merriman. BALI STEAK & SEAFOOD - at the Hilton Hawaiian Village Beach Resort & Spa. BLT STEAK - at the Trump Waikiki Beach Hotel. GYOTAKU - "Hawaii's favorite Japanese restaurant. HIMALAYAN KITCHEN - authentic Nepalese and Indian cuisine. 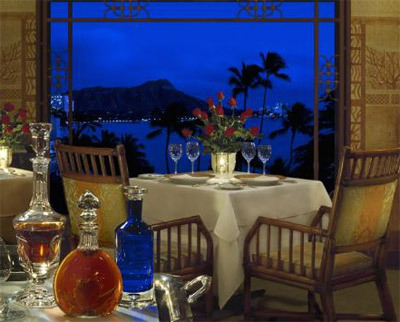 HOKU'S - at the Kahala Hotel & Resort. LA MER - at Halekulani Hotel. ROY'S RESTAURANT - Hawaiian fusion cuisine. RUM FIRE - at the Sheraton Waikiki Hotel. THE VERANDA - at the Moana Surfrider. HUALALAI GRILLE - at Four Seasons Resort. KAUAI GRILL - at The St. Regis Princeville Resort. 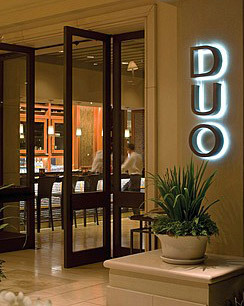 DUO - at the Four Seasons Resort. GERARD'S - chef: Gerard Reversade. Hali'imaile General Store - entering it's 20th year and is consistently rated one of Maui's best restaurants. LAHAINA GRILL - best Maui restaurant 17 years in a row (Honolulu Magazine). MAMA'S FISH HOUSE - for over 35 years Mama's has been the Maui destination for special occasions. 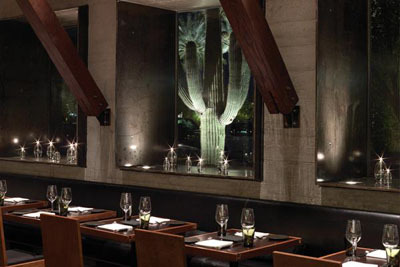 SPAGO - the menu offers Wolfgang Puck’s classics. At Four Seasons Resort Maui at Wailea. 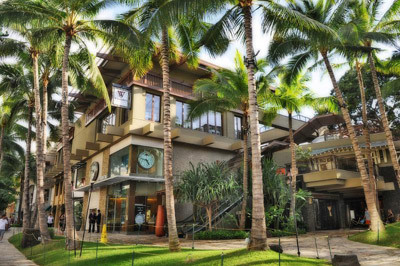 TROPICA - at The Westin Maui Resort & Spa. HANOHANO - at the Sheraton Waikiki Hotel. ALINEA *** SP (Chef de cuisine: Dave Beran). Allium * (Executive chef: Kevin Hickey). At Four Seasons Hotel Chicago. ANN SATHER LAKEVIEW RESTAURANT Bib. Swedish Cuisine. BLACKBIRD * (Chef: Paul Virant). 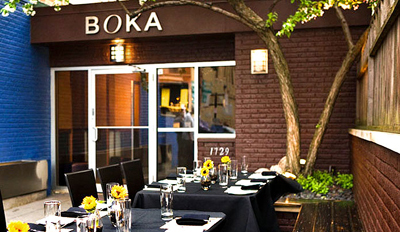 BOKA * (Executive chef: Giuseppe Tentori). BONSOIRÉE * (Chefs: Beverly Kim & Johnny Clark). CHARLIE TROTTER'S ** GTM (Chef: Charlie Trotter). Founded in 1987. 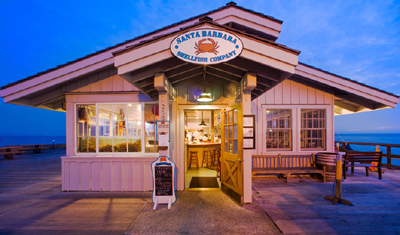 The restaurant will close by the end of 2012. COURTRIGHT'S * (Executive chef: Jerome Bacle). EVEREST * GTM R&C (Chef: Jean Joho). Located on the 40th floor of the Chicago Stock Exchange. JAIPUR Bib. Authentic Indian Cuisine. L²0 * (Chef: Matthew Kirkley). LONGMAN & EAGLE * (Chef: Jared Wentworth). MOTO * (Executive chef: Homaro Cantu). Molecular gastronomy. NAHA * (Chef: Carrie Nahabedian). NEXT (Chefs: Dave Beran & Grant Achatz). Thai cuisine. 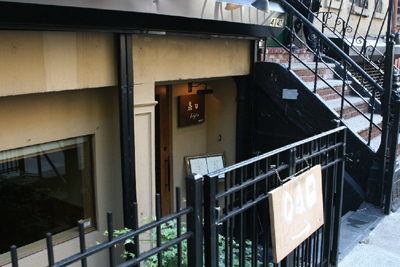 Belongs to Eater.com's list of the 11 toughest restaurants to get a reservation in the world. 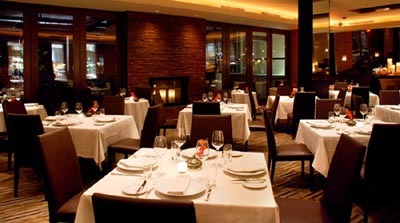 PRIMEHOUSE DAVID BURKE SDA (Executive chef: Rick Gresh). PUMP ROOM - established October 1, 1938, by Ernie Byfield, is a restaurant located in the Public Chicago Hotel, formerly The Ambassador East, in Chicago's Gold Coast area. The restaurant served a number of celebrities who were regular customers and has been written about in books and articles. 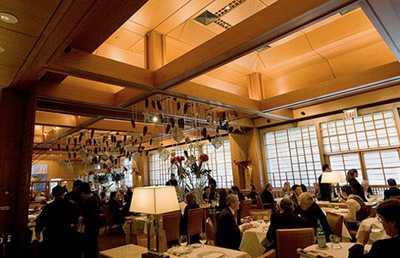 Arturo Petterino (1920–2010) was its maitre d' for many years, steering celebrity patrons to the coveted Booth One. RIA (**). At the Waldorf Astoria. Closed on July 27, 2012. SCHWA * (Chef: Michael Carlson). 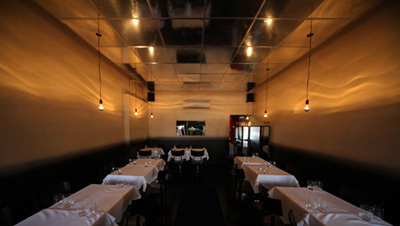 Belongs to Eater.com's list of the 11 toughest restaurants to get a reservation in the world. SEPIA * (Executive chef: Andrew Zimmerman). 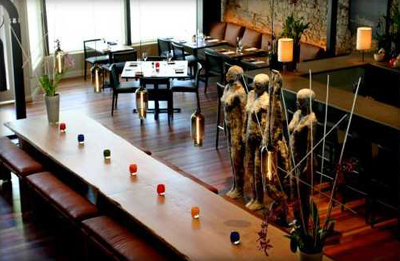 SIXTEEN (Executive chef: Thomas Lents). Located on the 16th floor of Trump International Hotel & Tower. SPIAGGIA * (Chef: Tony Mantuano). TAKASHI * (Chef: Takashi Yagihashi). TOPOLOBAMPO * (Chef: Rick Bayless). TRU * WS (Executive chef: Anthony Martin). Valois Cafeteria - 1518 E 53rd St. "See Your Food." 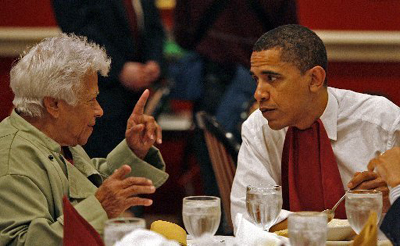 Barack Obama's Favorite Diner - EATER Chicago. VIE * (Chef: Paul Virant). Antoine's Restaurant - since 1840. Created in the 1890s the legendary Oysters Rockefeller. COMMANDER'S PALACE WS (Chef: Tory McPhail). Dooky Chase's - since 1941. 2301 Orleans Ave. "The premier restaurant for authentic Creole Cuisine." EMERIL'S WS (Chef: Emeril Lagasse). Rib Room - at hotel Omni Royal, 621 St. Louis Street. The White Barn Inn R&C (Chef: Jonathan Cartwright). TAKO GRILL - (Chef: Jeff Ramsey). Japanese cuisine. Recipient of the 'Gold Sushi Restaurant Award' at World Sushi Cup Japan 2013. 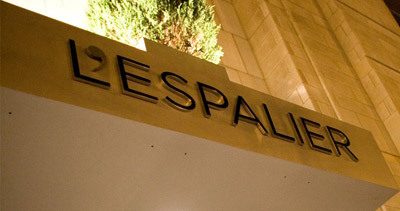 L'ESPALIER (Chef de Cuisine: Shane O'Neill). BLANTYRE R&C WS (Chef: Christopher Brooks). TOPPER'S R&C WS (Executive chef: Kyle Zachary). At The Wauwinet. Lef Bank Restaurant WS (Executive chef: Florent Boutet). At Stonehedge Inn & Spa. 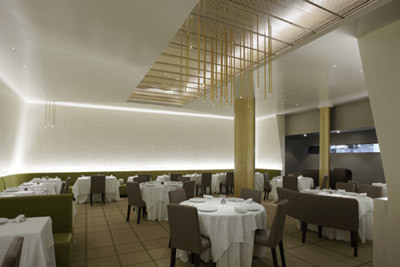 AUREOLE WS (Chef: Charlie Palmer). At Mandalay Bay Resort & Casino. BARMASA (Chef: Masa Takayama). At Aria Hotel Casino. CUT - from USDA Prime Nebraska corn-fed, 35-day dry-aged steaks to Japanese 100% Wagyu Beef. DELMONICO STEAKHOUSE WS (Chef: Emeril Lagasse). At The Venetian Resort Hotel Casino. Fleur by Hubert Keller - at Mandalay Bay. JOËL ROBUCHON *** WS (Executive chef: Claude Le Tohic). At MGM Grand. LE CIRQUE GTM (Chef: David Werly). At Bellagio. 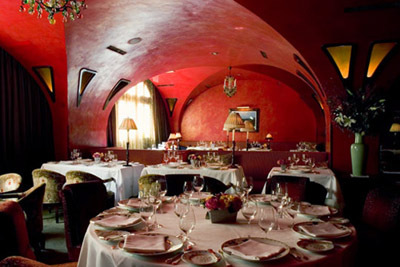 OSTERIA DEL CIRCO - a festive Italian trattoria, the creation of restaurateur, Sirio Maccioni, proprietor of Le Cirque, NYC. At the Bellagio. PICASSO WS (Chef: Julian Serrano). At Bellagio. 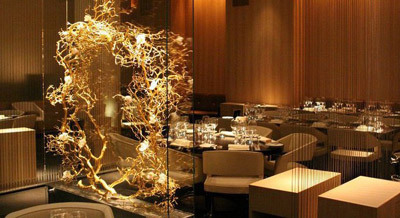 PRIME STEAKHOUSE (Chef: Jean-Georges Vongerichten). At Bellagio. RESTAURANT GUY SAVOY WS. At Caesar's Palace. TABLE 10 - by Emeril Lagasse. 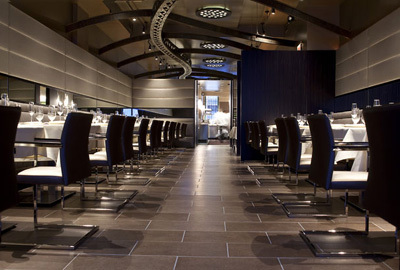 Twist by Pierre Gagnaire - located on the 23rd floor of Mandarin Oriental Hotel. VALENTINO WS (Executive chef: Luciano Pellegrini). At The Venetian Hotel & Casino. DYNASTY | IL MULINO | SAFARI STEAKHOUSE SDA. At Trump Taj Mahal. ROBERTO'S RISTORANTE SDA. At Trump Plaza. SOUL KITCHEN - community restaurant founded by the Jon Bon Jovi Soul Foundation. "A community restaurant with no prices on the menu; customers donate to pay for their meal." LATOUR WS (Chef: Michael Latour). Bedford Post Inn R&C. Owned by actor Richard Gere. CHEF'S TABLE AT BROOKLYN FARE *** NW (Head chef: Cesar Ramirez). Specialty: fried blowfish tails. 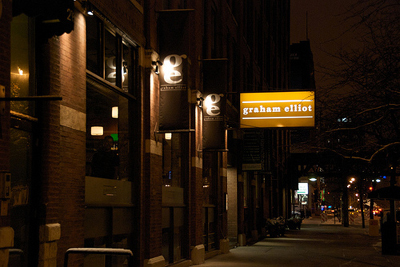 Belongs to Eater.com's list of the 11 toughest restaurants to get a reservation in the world. DRESSLER * (Executive chef: Polo Dobkin). FRANNY'S Bib NW. Specialty: spicy clam pizza. PETER LUGER STEAKHOUSE *. Est. 1887. RIVER CAFÉ *. "The Restaurant that Launched a Thousand Chefs." - New York Times. SAUL * (Head chef: Saul Bolton). TØRST * 615 Manhattan Avenue. MINETTA TAVERN *. Since 1937. "Over the course of its long history, the Tavern was frequented by various layabouts and hangers-on including Ernest Hemingway, Ezra Pound, Eugene O'Neill, E. E. Cummings, Dylan Thomas, and Joe Gould, as well as by various writers, poets, and pugilists." All Aboard the Nordic Express, at Agern - The New York Times. New York City - The Broadway Beat - Yodelout. 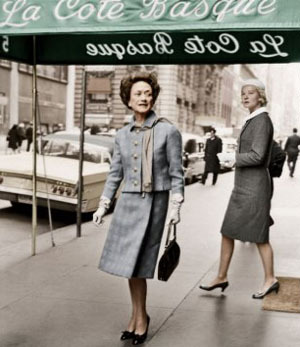 NEW YORK RESTAURANTS - New York Magazine. 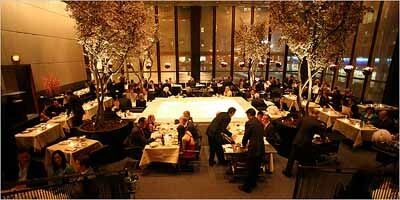 NEW YORK RESTAURANTS - "The ultimate guide to food and restaurants in New York." Nirvana, Nordic Style, at Grand Central’s New Food Hall - The New York Times. RESTAURANTS IN NEW YORK - Wikipedia. THE BEST RESTAURANTS IN NEW YORK CITY - Gayot. 21 CLUB WS. 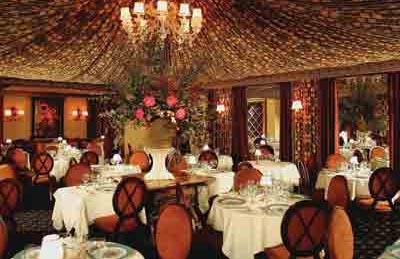 Famous NYC restaurant, serving fine American cuisine in the famous Bar Room, romantic Upstairs at '21', and 10 private banquet rooms. 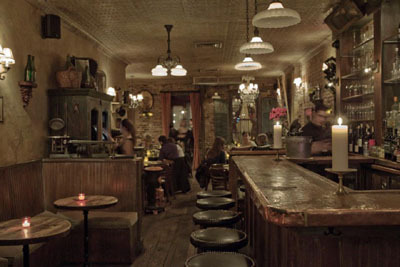 Opened in Greenwich Village in 1922, originally as a small speakeasy known as the Red Head. The bar also included a secret wine cellar, which was accessed through a hidden door in a brick wall which opened into the basement of the building next door (number 19). Though still used as a wine cellar today, part of the vault has been remodeled to allow a party of up to 20 guests to dine in private. 21 also stores the private wine collections of such celebrities as Presidents Gerald Ford, John F. Kennedy, and Richard Nixon, Elizabeth Taylor, Hugh Carey, Ernest Hemingway, Ivan Boesky, The Nordstrom Sisters, Frank Sinatra, Al Jolson, Gloria Vanderbilt, Sophia Loren, Mae West, Zsa Zsa Gabor, Aristotle Onassis, Gene Kelly, Gloria Swanson, Judy Garland, Sammy Davis, Jr. and Marilyn Monroe. Every President since Franklin Delano Roosevelt (except for George W. Bush) has dined at 21, and the restaurant has been frequented by so many celebrities that many of them have favorite tables. A VOCE COLUMBUS * WS (Executive chef: Missy Robbins). A VOCE MADISON * (Executive chef: Missy Robbins). ACME - a serious New Nordic menu from Danish chef Mads Refslund. ADOUR ALAIN DUCASSE * SDA (Chef: Didier Elena). At The St. Regis hotel. Agern * "A season-driven restaurant & bar located at Grand Central Terminal." 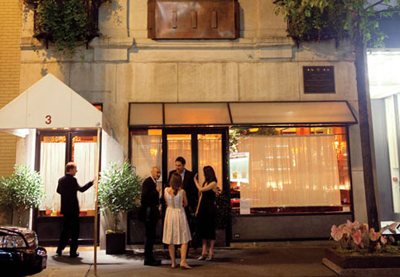 89 E 42nd St.
AI FIORI * (Chef: Michael White). At Langham Place, Fifth Avenue hotel. ALDEA * (Chef: George Mendes). ALTO **. Luxury Italian restaurant featuring Michael White's interpretation of Northern Italian cuisine, located in the Rockefeller Center area. Alto features a selection of over 2500 different wines. ANNISA * (Executive chef: Anita Lo). Arlington Club - "Steakhouse and Sushi." 1032 Lexington Ave. (between 73rd & 74th St). Atera ** (Executive chefs: Lightner & Ronny Emborg). 77 Worth Street. 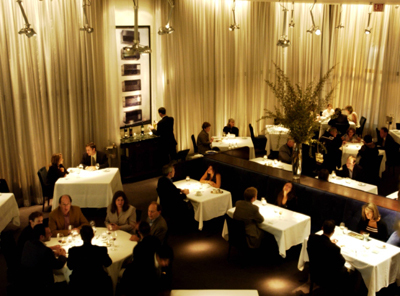 AUREOLE * (Executive chef: Marcus Gleadow-Ware). Aurora Soho - 510 Broome Street. Rustic Italian food in a Tuscan setting. BAR BASQUE - New York Times review. 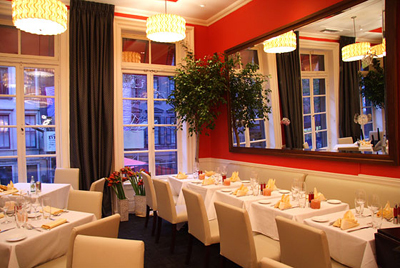 BABBO RISTORANTE - probably the best Italian restaurant in New York. Fantastic ravioli. BALTHAZAR (Chefs de Cuisine: Riad Nasr and Lee Hanson). BENOIT (Chef: Philippe Bertineau). The third member of Alain Ducasse's Benoit family. Former location for the legendary La Côte Basque (1962-2004). BLUE HILL *. At Greenwich Village. BOULEY * (Chef: David Bouley). At TriBeCa. 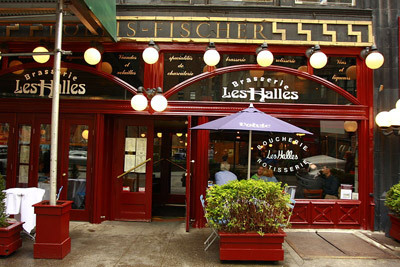 BRASSERIE LES HALLES Bib (Chef-at-large: Anthony Bourdain). Bravo Gianni - 230 E. 63rd St. Now closed. BRUSHSTROKE * (Chef: Isao Yamada). At TriBeCa. 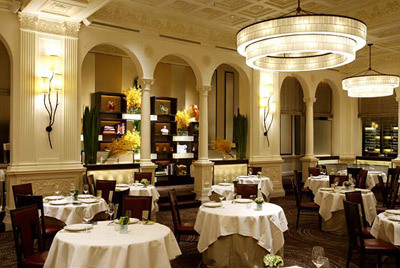 CAFÉ BOULUD * (Chef: Gavin Kaysen). CafÉ des Artistes - (1917-2009). It was designed for the residents of the Hotel des Artistes since the apartments lacked kitchens. Artists such as Marcel Duchamp, Norman Rockwell, Isadora Duncan or Rudolph Valentino were patrons. It was a popular spot for many celebrities because of its privately secluded yet hip atmosphere. Reopened in May 10th, 2011 as The Leopard at des Artistes. CafÉ Martin - (1902-1913). Fifth Avenue & 26th Street. A gathering spot for the beau monde, referring to that segment of the fashionable elite which would later be called “café society.” It was one the most interesting restaurants of the era. CARNEGIE DELI - founded in 1937, the world famous Carnegie Deli is a true New York City landmark situated in Midtown on 7th Avenue at 55th Street. "Our famous sandwiches and cheesecakes are the best in NYC and the world." CASA MONO * (Chef: Andy Nusser). CHEF'S TABLE AT BROOKLYN FARE *** NW (Head chef: Cesar Ramirez). Specialty: fried blowfish tails. At Brooklyn. 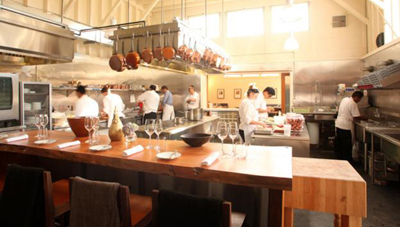 Belongs to Eater.com's list of the 11 toughest restaurants to get a reservation in the world. CHERIO’s - opened in 1948 on East 51st Street. Now closed. CIPRIANI 25 Broadway - the perfect complement to the four generation tradition of cuisine and service and the ideal setting for an elegant social, nonprofit or corporate event. CIPRIANI 42nd Street - the perfect venue for the most sophisticated celebrations. 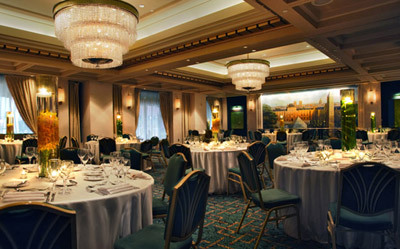 CIPRIANI Club 55 - provides you with a selection of intimate spaces perfect for any kind of business meeting or event: from the unique original vault room to the state-of-the art screening room, from an elegant library room to a beautiful colonnade terrace for the warmer months. CIPRIANI WALL STREET - stands as a triumph of Greek revival architecture, as well as a grand and luxurious venue for events. Coach House - (closed in 1993). 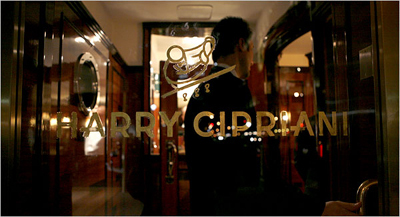 One of Aristotle Onassis's favorite New York restaurants. CORTON ** (Chef: Paul Liebrandt). At TriBeCa. Da Silvano - 260 Avenue of the Americas. "On May 1, 1975, Silvano Marchetto opened the doors to what was to become one of the most successful restaurants in New York history. Silvano reinvented Italian restaurants by introducing New Yorkers to Cucina Toscana (Tuscan Cuisine)." DAISY MAY'S BBQ Bib. "Best Barbecue in New York City." - Zagat. DANIEL *** SP GTM R&C NW WS (Chef: Daniel Boulud). Specialty: black sea bass in syrah. DANJI * (Chef: Hooni Kim). Korean cuisine. DANNY BROWN WINE BAR & KITCHEN * (Chef: Danny Brown). At Queens. Dave's Blue Room - 791 Seventh Avenue. "If you wanted to see celebrities in New York in 1920s, 30s and 40s, Dave’s Blue Room was the place to be." DB BISTRO MODERNE - chef: Laurent Kalkotour. DBGB KITCHEN & BAR Bib. Owned by chef Daniel Boulud. DEL POSTO * WS (Chef: Mario Batali). 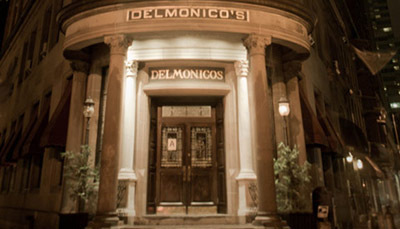 DELMONICO'S - at 2 South William Street (56 Beaver Street) since 1937. 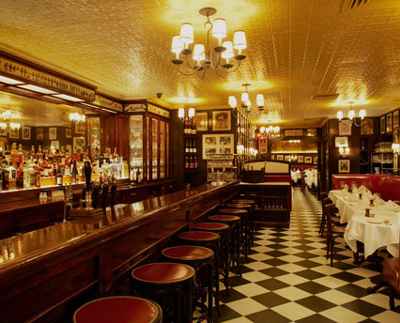 DELMONICO'S is the name of series of restaurants of varying duration, quality, and fame located in New York City. The restaurant was opened by the brothers John and Peter Delmonico, from Ticino, Switzerland. In 1831, they were joined by their nephew, Lorenzo Delmonico, who eventually became responsible for the restaurant's wine list and menu. When the William Street building was opened on a grand scale in August 1837, after the Great Fire of New York, New Yorkers were told that the columns by the entrance had been imported from the ruins of Pompeii. DORSIA - fictional restaurant in the 2000 film American Psycho. DOVETAIL * (Chef: John Fraser). Downey's Steakhouse - 505 8th Ave. This midtown restaurant was a favorite hangout of Broadway actors. Aka "the poor man's Sardi's." DRESSLER * (Executive chef: Polo Dobkin). At Brooklyn. EL PARADOR CAFE Bib. Best Manhattan Mexican restaurant & margaritas. 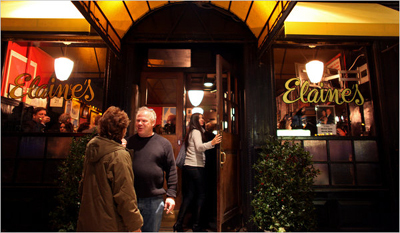 ELAINE'S - founded in 1963 by the legendary restaurateur Elaine Kaufman (1929-2010) whose restaurant attracts a following among prominent actors and other celebrities. Eleven Madison Park *** SP R&C WS Metropolitan Life North Building, 11 Madison Ave, New York, NY 10010, U.S.A. "Creative fine dining in the Big Apple with hospitality at its heart." Contemporary American restaurant. Won the award for best restaurant in the world in the 2017 poll. Head chef: Daniel Humm. Fowler & Wells - in the Beekman Hotel, 5 Beekman Street. Chef & restaurateur: Tom Colicchio. The dining room, set with rich, jewel-toned furnishings and antique accents, establishes Fowler & Wells as a one-of-a-kind setting for dining in lower Manhattan. FRANNY'S Bib NW. Specialty: spicy clam pizza. At Brooklyn. Fred's NYC - since 1997. "Come! Sit! Stay!" 476 Amsterdam Ave. (SW corner of 83rd & Amsterdam). "We are a family friendly neighborhood restaurant that takes pride in being part of the Upper West Side community." Freds Madison Avenue - 660 Madison Ave, 9th Floor. GILT ** WS (Executive chef: Justin Bogle). GOLDEN UNICORN Bib. Established in 1989. 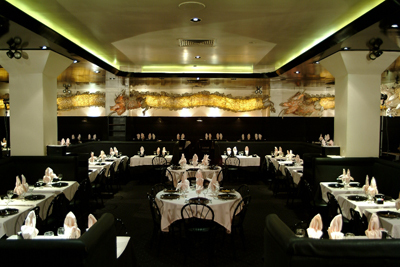 Cantonese-style dining restaurant. In 1996 named one of NYC's Five Best Restaurants by Food and Wine Magazine, making it the only Chinese restaurant to have been designated this distinction. GOTHAM BAR AND GRILL * (Chef: Alfred Portale). Opened its doors in 1984. 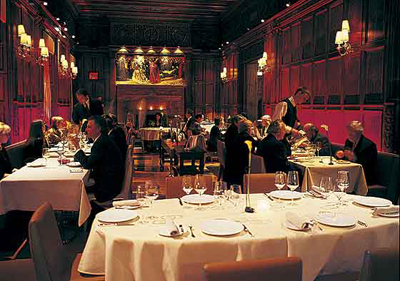 In 2009 named one of the most important New York City restaurants of the past forty years by New York Magazine. 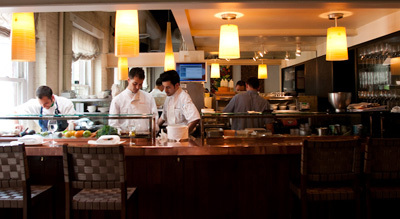 GRAMERCY TAVERN * (Executive chef: Michael Anthony). Harvey's Chelsea House - 108 W. 18th Street. NOW CLOSED. ibis - 151 East 50th Street. Executive chef: Orhan Yegen. Mediterranean cuisine. JEAN GEORGES *** sp GTM R&C (Chef: Jean-Georges Vongerichten). At the Trump International Hotel & Tower. JEWEL BAKO *. Japanese cuisine. Jimmy Weston's - (1967-1989). "From the time it opened at 131 East 54th Street in 1967, Jimmy Weston's was the place to be for anyone who liked big drinks, bear hugs, boisterous conviviality and jazz, or simply gawking at those who did. An eclectic assortment of Mr. Weston's celebrity pals on any given night might include Frank Sinatra, George Steinbrenner, Pete Rozelle, Richard Nixon, Howard Cosell, Hugh Carey, Muhammad Ali, Leo Durocher, Tony Bennett and any big-time basketball coaches who happened to be in town." 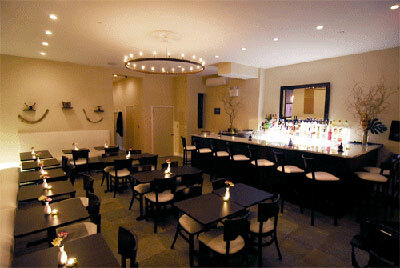 JOANNE TRATTORIA - Lady Gaga's parent's, Joseph and Cynthia Germanotta, new restaurant. Executive chef: Art Smith (Oprah Winfrey's former personal chef). JUNOON *. Contemporary Indian cuisine. KAFANA NW. Serbian cuisine. Specialty: cevapi with onions. KAJITSU ** (Chef: Masato Nishihara). Shojin Cuisine. KATZ'S DELICATESSEN Bib. Since 1888. King of the Sea - 53rd Street at 3rd Avenue. KYO YA *. Japanese cuisine. L'ATELIER DE JOËL ROBUCHON (**). At The Four Seasons Hotel. Closed on June 30, 2012. 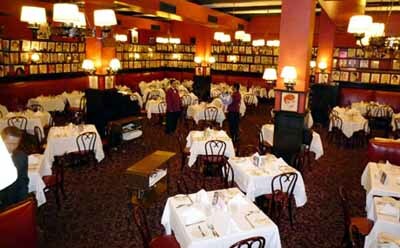 LA CARAVELLE - "The finest restaurant in New York on almost every count." (1960-2004). Obituary: The New York Times. LA CÔTE BASQUE - (1962 - March 7, 2004). Obituary: The New Yorker. Now location for BENOIT (Chef: Philippe Bertineau). The third member of Alain Ducasse's Benoit family. LA GRENOUILLE - since 1962. LAFAYETTE - 202 East 50th Street. Closed. LAUT *. Malaysian & Thai cuisine. L'ECOLE Bib. 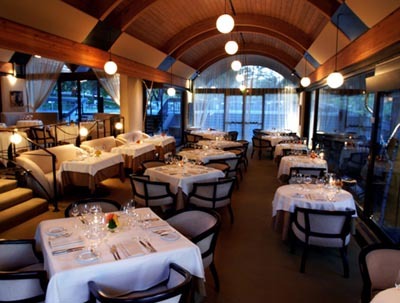 The Restaurant of The French Culinary Institute. 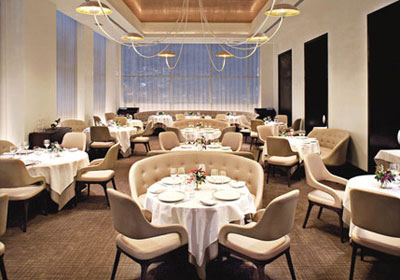 LE BERNARDIN *** SP (Chef: Eric Ripert). LE CAPRICE - chef: Edward Carew. At Pierre Hotel. LE CIRQUE GTM. "A place where the worlds of food, fashion, art and culture converge." 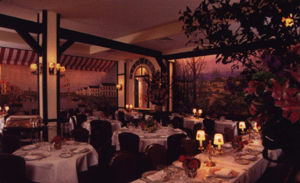 French restaurant first opened at the Mayfair Hotel in 1974. Owned and operated by Sirio Maccioni. The latest installation of Le Cirque opened in 2006 in the Bloomberg Tower building at One Beacon Court. The current flagship location is 16,000-square-foot (1,500 m2). Le Pavillon - (1941-1971). The most influential French restaurant in America in the 1940's and 50's. Le Voisin - (1913-1967). "The Always-Moving French Restaurant." Lindy's - deli and restaurant with two locations in Manhattan, New York City, at 825 7th Avenue (at 53rd Street) and 401 7th Avenue (at 32nd Street). Lindy's is best known for its original incarnation which opened in 1921 on Broadway. Lindy's was opened by Leo "Lindy" Lindermann (died 1957) and his wife Clara on August 20, 1921, and was located at 1626 Broadway, between 49th and 50th Streets. The original Lindy's location closed in 1957. Damon Runyon was a big fan and wrote the restaurant into his books as "Mindy's." The musical Guys and Dolls, based on Runyon's writings, immortalizes Lindy's in one of its songs. Milton Berle frequented Lindy's almost on a nightly basis. Jewish Mafia icon Arnold Rothstein claimed Lindy's as his favorite "office" and would stand on the corner, surrounded by bodyguards, and conduct business outside. Lindy's was especially well known for its cheesecake, which was at times credited as perhaps the most famous in the United States. The cheesecake was immortalized in Guys and Dolls, where Nathan Detroit and Sky Masterson sang its praises. Longchamps - (1919-1975). Was a chain of several upscale restaurants centered in Manhattan that consisted of twenty or more locations at its peak, including the Showboat Restaurant located in the Empire State Building. LUTÈCE - (1961 - February 14, 2004). 249 East 50th. Obituary: The New York Times. MARC FORGIONE * (Chef: Marc "Forge" Forgione). At TriBeCa. MAREA ** (Chef: Michael White). MASA *** sp (Chef: Masa Takayama). Measure (Chef: Jeffrey Seizer). At Langham Place, Fifth Avenue hotel. Michael's - since 1989. 24 W 55th Street. MINETTA TAVERN * (Chef de cuisine: William Brasile). Since 1937. "Over the course of its long history, the Tavern was frequented by various layabouts and hangers-on including Ernest Hemingway, Ezra Pound, Eugene O'Neill, E. E. Cummings, Dylan Thomas, and Joe Gould, as well as by various writers, poets, and pugilists." MOMOFUKU KO ** sp (Chef: Sean Gray). MOMOFUKU NOODLE BAR Bib NW (Chef de cuisine: Sean Heller). Specialty: pork-belly ramen. MOMOFUKU SSÄM BAR Bib SP (Chef de cuisine: Ryan Miller). 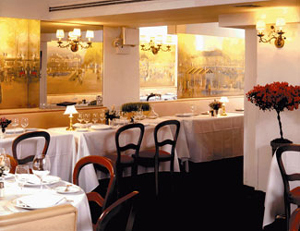 Monte-Carlo NYC - "French restaurant NYC hand-picked food highest quality homemade food great service hospitality." 181 E 78th St.
Mortimer's - (1976-1998). On Lexington Avenue at East 75th Street. A favorite watering hole for Manhattan socialites, glitz folk and achievers; the public outpost for the rich and socially registered. Run for 22 years by Glenn Bernbaum, a Solomon of bistro seating, as a private club to the sort of fashionables whose names fill the gossip columns. Morton's The Steakhouse - 551 5th Avenue. 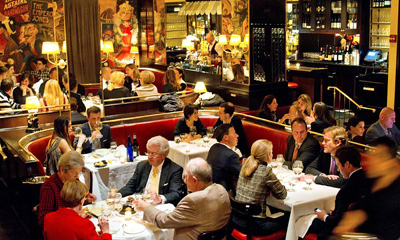 "For more than 30 years, Morton's is the steakhouse by which all others are measured." MR CHOW - "World Renown Upscale Authentic Beijing Cuisine." NOBU Japanese cuisine. At TriBeCa. OCEAN GRILL - "A fabulous New York seafood restaurant with fresh sushi, raw bar selections and long-time signatures, like the crab crusted Mahi Mahi, continue to impress seafood lovers across the city." OCEANA * (Executive chef: Ben Pollinger). 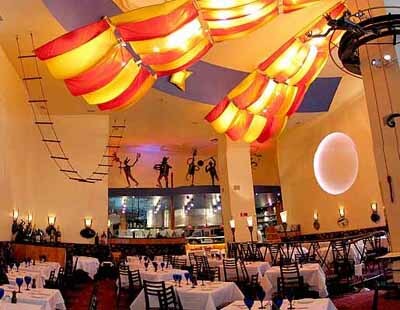 OSTERIA DEL CIRCO - a festive Italian trattoria, the creation of restaurateur, Sirio Maccioni, proprietor of Le Cirque. 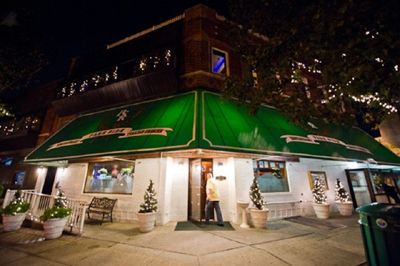 Park Side Restaurant - "An Italian Landmark in the heart of Corona, Queens. 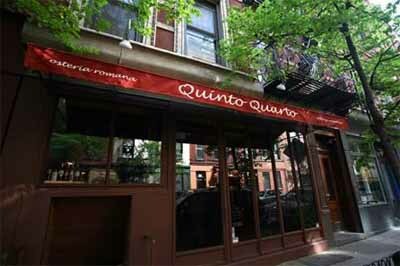 After one visit, you will be sure to be back again and again for one the city's Best Italian restaurants." PARM NW. Specialty: 'Italian Thanksgiving'. PER SE *** SP SDA GTM R&C (Chef: Thomas Keller). PETER LUGER STEAKHOUSE *. Since 1887. At Brooklyn. PICHOLINE * (Chef: Terrance Brennan). PONGAL - Indian vegetarian cuisine bursting with all the natural flavors and spices true to its original tradition. Consistently applauded by ZAGAT, MICHELLIN , THE NEW YORK TIMES, NY TIMEOUT and millions of highly satisfied customers since 1996, Pongal offers one of the most unique menus in New York city which is also Kosher. PRANNA - (Chefs: Chai Trivedi & Gavin Portsmouth). "Modern Southeast Asian Cooking." Borrowing flavors and inspiration from Thailand, Vietnam, Cambodia, Laos, Malaysia and India. PUBLIC * (Executive chef: Brad Farmerie). QUO VADIS - (1946-1984). East 63d Street. Obituary: The New York Times. 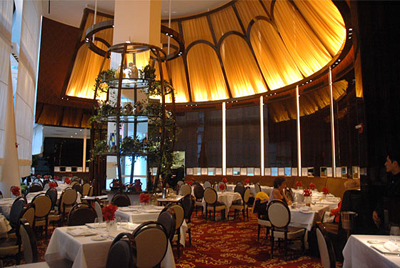 Rainbow Room - fine-dining restaurant and event space previously run by the Cipriani family on the 65th floor of the Comcast Building at 30 Rockefeller Center in New York City. Opened in 1934, it was the first restaurant to be located in a high-rise building and remained the highest elevated restaurant in the United States for decades. 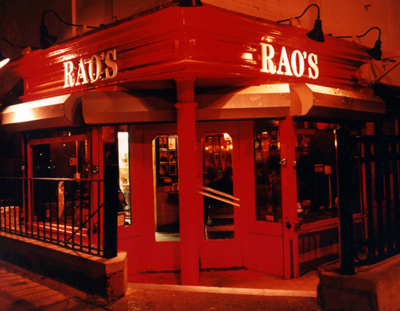 RAO'S - Southern Italian restaurant founded in 1896. Rector's - (1899-1914). "The Elaine’s of 1899." RESTAURANT AQUAVIT - opened in 1987 and has been the premier Scandinavian dining destination in Midtown Manhattan ever since. 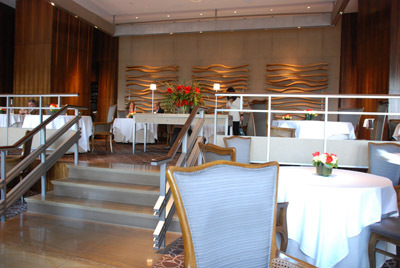 RESTAURANT DANIEL *** SP GTM R&C (Chef: Daniel Boulud). Reuben's Restaurant - (1908-2001). 244 Madison Avenue. Reuben's Restaurant and Delicatessen was a landmark restaurant and deli in New York City. RIVER CAFÉ *. "The Restaurant that Launched a Thousand Chefs." - New York Times. At Brooklyn. 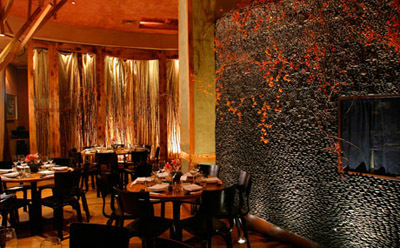 Rosa Mexicano - "Fine Dining Restaurant | Best Mexican Food." ROSANJIN *. Japanese cuisine of Kaiseki. At TriBeCa. ROUGE TOMATE * (Executive chef: Jeremy Bearman). 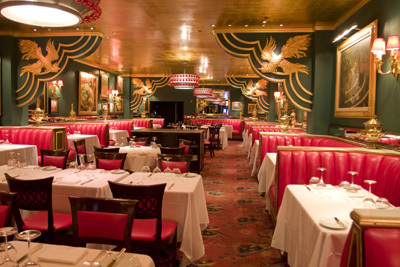 Russian Tea Room - since 1927. Russo-Continental restaurant. SARAVANAAS Bib. Indian vegeterian restaurant. SARDI'S - opened in 1927. Known for the hundreds of caricatures of show-business celebrities that adorn its walls. Also the birthplace of the Tony Award in 1947. SAUL * (Head chef: Saul Bolton). At Brooklyn. SEËSONAL * (Chefs: Wolfgang Ban & Eduard Frauneder). Serendipity 3 - "Since 1954, its menu of outrageous desserts and fun food, served in a Manhattan townhouse amid exuberant Victorian decorations, has charmed children and their parents, not to mention celebrities from Andy Warhol to Beyonce." In November 2007, Serendipity unveiled a $1,000 dessert called the The Golden Opulence Sundae, which Guinness World Records declared the world's most expensive dessert; in May 2012 for serving the world’s most expensive hamburger, the $295 Le Burger Extravagant and in June 2015 for serving the world’s most expensive grilled cheese sandwich for $214. Shanley's - (1890-1925). Were elegant Manhattan eateries. 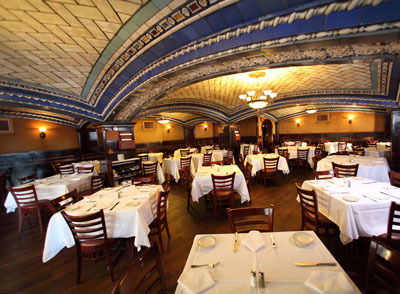 Shanley's "uptown" spot became a rendezvous for stage and political celebrities.John and Ethyl Barrymore, Teddy Roosevelt, Harry Houdini, David Belasco, Richard Mansfield, "Diamond Jim" Brady and Lillian Russell might be seen at adjacent tables. When Adolph Ochs built the Times Tower on Longacre Square (later Times Square) in 1904, Shanley's became the social headquarters for his editorial and executive staff. Sherry's - (1890-1919). At 5th Ave at the corner of 37th street. One of the most famous culinary landmarks in New York until the advent of prohibition. SHUN LEE - haute Chinese cuisine and Lincoln Center standby. SHUN LEE Palace - upscale Chinese restaurant located in busy Midtown East Manhattan specializing in serving trendy and eclectic cuisine for over 40 years. Sign of the Dove - (1962-1998). A " shamelessly high-end" Upper East Side restaurant known as both a destination for socialites and the most romantic date spot in town. In September 1965 it was the site of a party Jacqueline Kennedy threw for the economist John Kenneth Galbraith, an occasion reported on by Time magazine as one of her first public forays after her husband’s assassination nearly two years earlier. SIP SAK Bib. The Best Turkish Food in New York. SMITH & WOLLENSKY - "The Quintessential New York City Steakhouse." SOTO ** (Chef: Sotohiro Kosugi). Sparks Steak House - opened in 1966. Located at 210 East 46th Street (between Second Avenue and Third Avenue) in Midtown Manhattan. Gambino crime family boss Paul Castellano and underboss Thomas Bilotti were gunned down near its entrance in 1985. The hit was given under the orders of John Gotti. SUSHI AZABU *. At TriBeCa. TAMARIND TRIBECA *. At TriBeCa. Tapas CafÉ - 408 Broome Street. Aka The King of Tapas. TAVERN ON THE GREEN - since 1934. American cuisine restaurant located in Central Park in Manhattan. 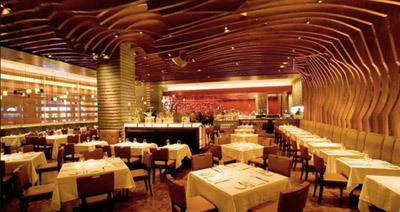 The restaurant in 2007 had gross revenues of US$38 million, from more than 500,000 visitors, making it the second-highest-grossing independent restaurant in the United States (behind The Venetian's Tao restaurant in Las Vegas, at US$67 million). The Brass Rail - NOW CLOSED. 745 Seventh Avenue (at 49th Street). This Times Square establishment was one of those places reminding the visitor somewhat of a cafeteria, without at all being one. Good, and moderate prices. The Clocktower - at the New York Edition Hotel, 5 Madison Avenue (at 24th Street). THE COLONY - (1920-1971). Madison Avenue / 30 East 61st Street. THE COPENHAGEN - "An Authentic Danish Culinary Experience in NYC." 13 Laight St. THE DARBY (Chef: Alex Guarnaschelli). THE FORUM OF THE TWELVE CAESARS - (Mad Men , season 4, episode 7: "The Suitcase"). THE FOUR SEASONS - opened in 1959 at the Seagram Building. Known as much for its clientele as its food, with its Midtown location in the Seagram Building making it convenient for power lunches. THE LITTLE OWL - burgers served by Hamburger-virtuoso Pat La Frieda. Burger-lovers Mekka. THE MODERN * (Chef: Gabriel Krether). 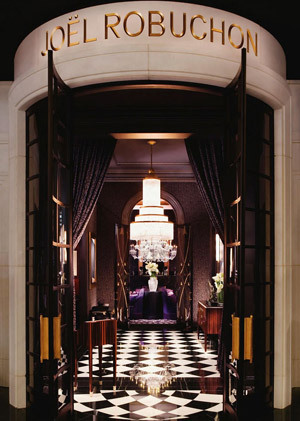 THE OAK ROOM - New York's fabled landmark, is now open in The Plaza Hotel, reinstating the New York icon as the most romantic meeting spot in New York City. 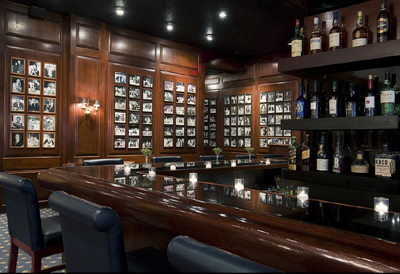 THE POLO BAR - 1 East 55th Street. "Visit The Polo Bar by Ralph Lauren for classic American cuisine and specialty cocktails inspired by Ralph Lauren's favorites in a refined, yet casual setting." THE WAYFARER - "American Seafood Grill." 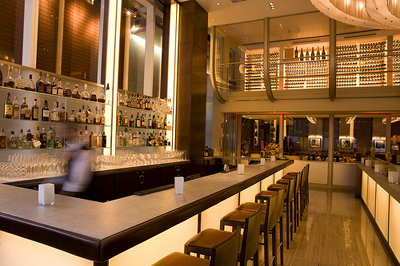 At the Quin hotel, located on the corner of 57th Street and 6th Avenue. Top of the Tower Restaurant - at the Beekman Tower Hotel. TORI SHIN *. Japanese cuisine, sushi. Trader Vic's - (1965-1989). Legendary Polynesian restaurant in the Plaza Hotel. 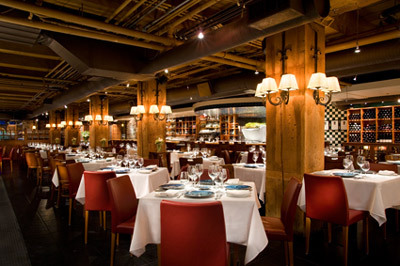 TRIBECA GRILL WS (Executive chef: Kamal Rose). At TriBeCa. TULSI * (Executive chef: Hemant Mathur). Umbertos Clam House - "The Heart of Little Italy." Italian seafood restaurant located at 132 Mulberry Street (at Broome Street) in Little Italy in Manhattan (New York City). Two months after opening, on April 7, 1972, New York gangster 'Crazy Joe' Gallo was shot and killed at the eatery, where his party of family and friends) had stopped for an early morning snack after celebrating his 43rd birthday at the Copacabana. VERITAS * WS (Chef: Sam Hazen). Contemporary American cuisine. VERSAILLES - 151 East 50th Street. (CLOSED). 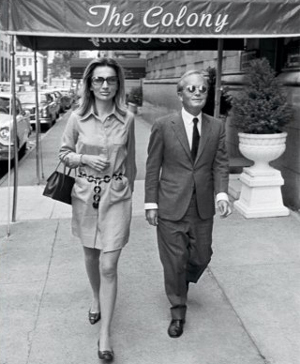 One of Aristotle Onassis's favorite New York restaurants. Now IBIS. WD-50 * (Chef: Wylie Dufresne). WOO LAE OAK - Korean restaurant. ZOMA Bib. "The Essence of Abyssinia." blue hill at stone barns sp (Chef: Dan Barber). DANNY BROWN WINE BAR & KITCHEN * (Chef: Danny Brown). THE AMERICAN HOTEL RESTAURANT WS (Executive chef: Jonathan Parker). BOULEY * (Chef: David Bouley). BRUSHSTROKE * (Chef: Isao Yamada). CORTON ** (Chef: Paul Liebrandt). MARC FORGIONE * (Chef: Marc "Forge" Forgione). ROSANJIN *. Japanese cuisine of Kaiseki. 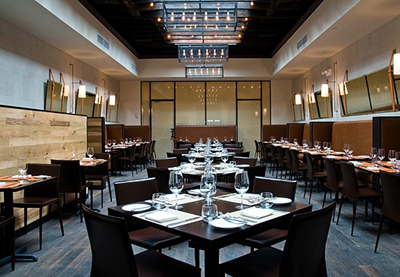 TRIBECA GRILL WS (Executive chef: Kamal Rose). herons at the umstead hotel and spa NW (Executive chef: Scott Crawford & Chef de cuisine: John Childers). Specialty: olive-oil-poached grouper. The Angus Barn WS (Chef: Walter Royal). 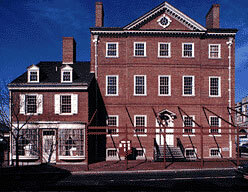 CITY TAVERN - since 1773. "A Triumph of Tradition." Owner and Executive Chef Walter Staib cooks a variety of entrees using authentic 18th century recipes, served in seven period dining rooms, three wine cellar rooms and an outdoor garden. Osteria NW. Specialty: fresh pasta. Best Restaurants in Newport, RI - TripAdvisor. Newport Restaurant Week - March 20-29. 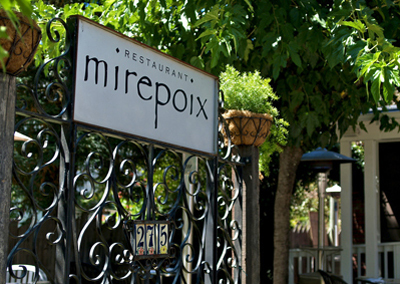 Three-course prix fixe: Lunch $16 and Dinner $35. Tantalize your taste buds at Newport & Bristol Restaurant Week! Diners will enjoy three course prix fixe meals at exceptional values... lunch for $16 and dinner for $35. Beverages, gratuities and taxes are not included. Newport, Rhode Island (and area) restaurants - NewportsRestaurants.com. 12 Metre Club Room - 26 Bannister's Wharf. "The Club Room, Newport's station for the 12 Metre Yacht Club, is an intimate dining room in the original section of the 18th century house. 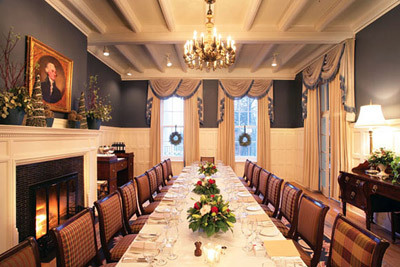 The Club Room is the favored spot for small to mid-sized gatherings." 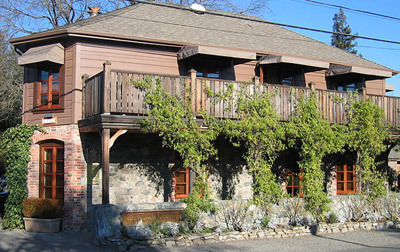 Brick Alley Pub & Restaurant - 140 Thames St.
Castle Hill Inn R&C 590 Ocean Avenue. Clarke Cooke House - 26 Bannister's Wharf. "Renowned for its innovative cuisine, it is legendary as the heartbeat of Newport, RI. Whether local or visiting, the Clarke Cooke House is an unparalleled, quintessential Newport experience. We've been hosts to royalty and yachting stars, captains of industry and charming scalawags, to occasions whimsical and outrageous. Whether a quiet dinner or late night revelry, our goal has always been to provide great food, professional service, and a sophisticated environment." Sardella's Italian Restaurant - 30 Memorial Blvd W. Executive Chef: Kevin Fitzgerald. Founded by former mayor of Newport Richard Sardella in 1980. 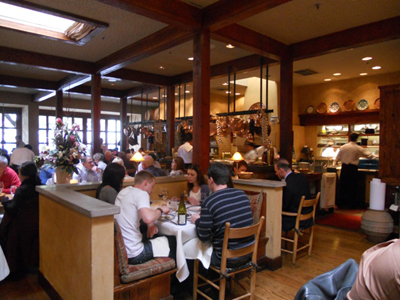 Sardella’s specializes in Northern and Southern Italian cuisine. Over the years, Sardella’s has been recognized as “Best Italian Restaurant” by Rhode Island Monthly and Newport Life magazines. Sardella’s is a favorite spot of many locals, celebrities, politicians and tourists. The Black Pearl The Tavern - 10 1/2 W Pelham St., Bannister's Wharf. The Mooring Seafood Kitchen & Bar - 1 Sayers Wharf. "Elevates the Newport seafood tradition to a new level, providing a casual elegance while maintaining all of its relaxed Newport charm." White Horse Tavern - since 1673. One of the oldest tavern buildings in the United States. Located on the corner of Farewell & Marlborough streets. Blue Cottage Inc - 748 Hope St.
Providence Oyster Bar - 283 Atwells Ave. "Serving Rhode Island Fresh Seafood For Over 25 Years." Husk NW. Specialty: pig's-ear lettuce wraps. McCrady's NW (Chef: Sean Brock). Specialty: molasses pork belly. Blackberry Farm R&C WS (Chef: Joseph Lenn). Pappas Bros. Steakhouse WS (Executive chef: James Johnson). SNOW'S BBQ - voted best Texas barbecue. CITY MARKET NW. Specialty: fatty brisket. THE INN AT LITTLE WASHINGTON GTM R&C WS (Chef: Patrick O'Connell). WILD GINGER WS (Executive chef: Jacky Lo). Asian cuisine & Satay bar. THE WILLOWS INN (Chef: Blaine Wetzel). Since 1910. 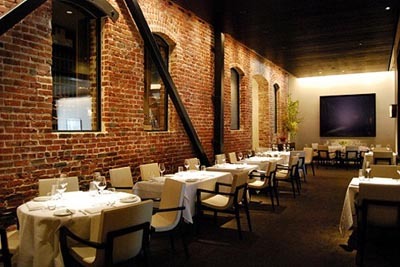 CANLIS WS (Executive chef: Jason Franey).